Most strength coaches would list pull-ups and push-ups among their top exercises, regardless of whether or not they specialize in bodyweight training. 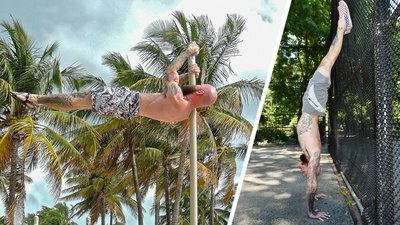 It's great to see these timeless classics getting some recognition, but in the world of calisthenics, they're just the start of the fun. I love the muscle building potential of bodyweight training. However, my favorite calisthenics exercises are the ones that allow you to work on improving your range of motion and body awareness, while building strength at the same time. While the more esoteric subdisciplines of calisthenics may not be for everyone, the following four moves are attainable for everyday gym folks, and most people could benefit from adding them to their training. Think about how much weight you can hold in an overhead barbell press. Is it more than your entire body weight? Probably not. That's part of why handstands are awesome: They will build serious strength and endurance in your shoulders, arms, chest, and back, but you can also use the handstand to improve your flexibility. Kick yourself up into a handstand with your back facing a wall, leaving several inches between the wall and your fingers. Now, instead of looking at the floor, look forward and think about pushing your chest out away from the wall, letting your back arch a bit for counterbalance. The idea is to aim for a straight line from your wrists to your hips. It may not happen on your first attempt, so give it some time and remember to breathe. This doozy of an exercise can pose a major mobility challenge, while also making serious strength demands on the spine, glutes, arms, and legs. The full back bridge may not be accessible at first, so feel free to start with a neck bridge, aka "wrestler's bridge," and gradually work toward fully extending your arms. You can also try placing the heels of your hands against a wall, which allows you to push harder with your arms without worrying about your hands sliding out from underneath you. If you've had issues with your hands slipping, definitely give this a shot. Additionally, elevating your feet can make the bridge less difficult mobility-wise, as your spine doesn't have to bend as much in order for you to straighten your arms. In fact, if you elevate your feet enough, you can combine this with the previous exercise and make a back bridge/handstand hybrid. This gruesomely named exercise opens the shoulders from the opposite direction, similar to what gymnasts call "shoulder inlocation." You're basically turning the shoulders in on themselves, but as long as you don't try to go too far, too soon, it's actually a wonderful stretch that can improve your posture and shoulder functionality. It also takes a lot of core strength, upper-body pulling strength, and better-than-average mobility in the hips and lower back, providing a lot of benefits from a single movement. Gymnasts typically use rings for this exercise, but you can get the same benefits using a pull-up bar. To perform a skin-the-cat, hang from a bar with an overhand grip, then pull your knees all the way toward your chest. When you can't get them any higher, begin rotating your body beneath the bar so your legs and feet pass behind it on the other side. Continue lowering yourself until your legs are fully extended with your arms positioned behind your back. This is sometimes known as a "German hang." This is the position that will give you that stretch in your shoulders. Pause here briefly, then tuck your knees toward your chest, raise your hips up toward the bar and thread your legs back around, returning to the start position. When starting out, you may have to cross your ankles to get your legs under the bar. Folks with limited mobility tend to have a particularly hard time with this. There is also a great deal of shoulder flexibility required. Do your best to avoid bending your elbows during this exercise. Bruce Lee himself is credited with inventing this exercise, so it's only fitting that the dragon flag would be one of the most difficult and humbling exercises in existence. Whether performed up and down for reps, or simply held as an isometric hold, the dragon flag is a tremendous full-body challenge. To perform a dragon flag, lie on the ground or a bench, gripping a sturdy object behind your head. Tense your entire body as you lift your hips and legs into the air, stacking your body vertically above your shoulders. In addition to engaging your core, use your arms to lift yourself into position. This top position can be a major stretch for your spine and neck, so be careful not to pull too hard against the back of your head. From the top position, carefully lower yourself down until you are hovering just above the ground, maintaining a straight line from your shoulders to your toes, then raise back up to the top position. Be mindful to avoid folding at the hips. In fact, it may even be useful to imagine overextending your hips to compensate for the body's tendency to do the opposite. While the full dragon flag requires both legs to be fully extended, it can be helpful to use a modified version with one or both knees tucked as a progression. You can also practice an advanced version of the dragon flag using a vertical pole against one shoulder. With calisthenics, there's always a way to take things to another level!